It’s time once again to celebrate the way the Wookiees do and herald in the Life Day celebration. 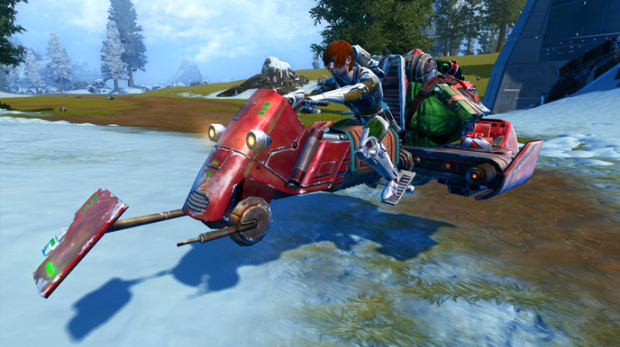 This year BioWare is adding the usual festivities in the way of snowball fights, fireworks, and the “Sleigh I” mount. Gotta love the “Slave I” pun there! The Sleigh I mount is a much better option than last year’s “mount with lights” option, in my opinion. How do you get it? Well, throw some snowballs, my friends! Literally, that’s all you have to do. Each throw has a chance to earn you a Snow-Covered Parcel. Collect enough of them and you can turn them in for the Sleigh I or other rewards. Life Day also adds level range specific missions that dish out even more furnishings for your stronghold as well as a few other perks. The Cartel Market isn’t immune to the holiday spirit though and is also getting a few new additions, my favorite being the JO-1Y mount. Think of it as similar to a Pod Racer from Episode I with 4 burners instead of two projecting on wires in front of the mount and you’ve got the picture. Cartel Packs will also have special pricing for a limited time until December 29th. The Life Day events are now live and will run until January 6th. You can check out all the rewards available on the event’s official page.